Can you imagine having your cancer cells wiped out without surgery or pain? Can you imagine it costing under $5,000 dollars to reverse the diagnosis from “terminal cancer” to “cancer free”? But many who have tried the Rife Frequency machine discovered that the pain was the first to go. Then they regained their appetite and the body began to restore itself. If you’re like many people, you’ve probably never heard of Rife Frequency or its inventor, Dr. Rife. But it’s a story worth learning − especially for anyone touched by cancer. Who Was Dr. Royal Ramond Rife? Dr. Royal R. Rife (1888-1971) was an amazingly intelligent microbiologist with a passion for truth and healing. His story reveals a great deal about the goodness of gifted men willing to sacrifice everything to save humanity from the suffering of terminal cancer. This is a story filled with intrigue and drama; a message of hope for people afraid of cancer or suffering from cancer. Through the brilliance of several men throughout history, a means to defeat disease was created and lost − and then recreated again. This article is meant to shed light on the science behind cancer and how four men over a period of 100 plus years discovered how to destroy it. It also reveals the challenges these same men faced from the cancer industry. The medical mafia have done much to destroy these devices and the men that developed them over the last 110 years. But fortunately there are good people who keep working for our benefit. And in keeping with The Truth About Cancer’s message of hope, it is my intention here to bring hope to those suffering that it is possible to conquer cancer. In the early 1900s, Dr. Royal Rife discovered a means to view live viruses under the microscope that he built (called the Universal Microscope) with over 6,000 parts and magnification up to 60,000 times the subject’s normal size. Because of this tool, he was awarded the honor of being the first scientist to discover, by viewing it live, the cancer virus that attacks human cells. After studying the cancer virus, a microbe, he was able to determine several different kinds using a slit-spectroscope. It sounds complicated, but basically it is a crystal that shines light through an instrument that can split the light into individual wavelengths. This is important because invisible and visible light are made up of wavelengths that can be measured. Royal Rife discovered the unique spectroscopic signature of each cancer virus. Then he used the color wavelength (spectroscopic signature) to make them visible under the virus microscope (Universal Microscope). The science behind this is resonant frequency in light wavelengths. The individual beam or light ray hits the virus and the virus resonates or vibrates making it visible under the special microscope. Similar to sound waves, we hear the sound a certain way because of the vibration it makes in our ears. The sound can also be felt as a vibration, which is the way people who are deaf can detect sound. This resonance is significant because it matches each type of cancer virus uniquely. With the aide of his Universal Microscope, Rife observed the cancer virus invading tissue in the petri dish. He also realized that the cancer virus takes on different shapes as it goes through its lifecycle, similar to how insects change form through their lifecycle (i.e. the moth lays eggs that become worms that develop into moths). Without this knowledge it is difficult to track the virus and easy to confuse it with other entities. What Is the RIFE Frequency? After several years of tracking these cancer virus, Dr. Rife developed a technique referred to as the RIFE Frequency. Simply put, he used the resonant frequency (the frequency that the virus vibrates at) to cause the virus to oscillate and then turned up the intensity or volume if you will. This resulted in the structural integrity of the virus collapsing and destroying itself. This phenomena was referred to by Rife as the “mortal oscillatory rate” or MOR. 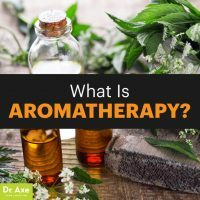 The good news is, every cell and bacteria resonate at their own unique frequency with healthy cells and probiotics vibrating at a higher frequency. As a result only the targeted cancer virus gets destroyed, leaving the other tissues intact. The germ gets killed and the body is relieved of the infectious agent without damage. In 1934, Royal Rife was given a number of human test subjects. This group was from the Pasadena County Hospital and all of them had terminal cancer. They had been essentially left to die because no more could be done for them by the cancer industry. Under the supervision of a Special Medical Research Committee of pathologists and oncologists from the University of Southern California (USC), the patients were brought to Rife’s laboratory in San Diego to undergo his unique experimental treatment. It was their job to expertly document the progress of the patients over a 90-day period during treatment. They reported astounding results: 86.5% of the patients were completely cancer free. Another 13.5% received an adjusted treatment (more potent) for an additional 30 days and then they also became 100% cancer-free. In conclusion Rife’s “beam-ray” technology was 100% effective against terminal (stage IV) cancer in all of the participants. However, not everyone was excited about this success. 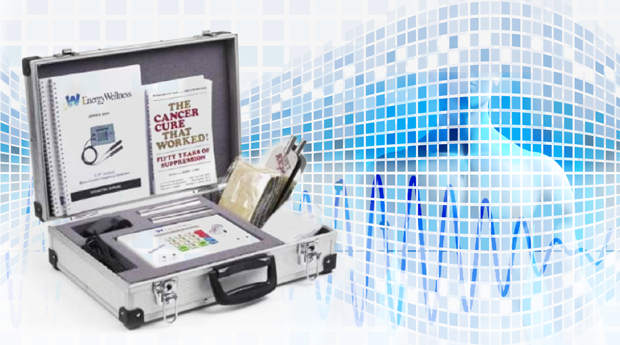 Rife’s technology posed a huge threat to the cancer industry and medical institutions in general who, according to statistics, get most of their revenue from oncology. In other words, if cancer can be cured they would go bankrupt − and lose out on making billions of dollars treating cancer patients. They were not about to let that happen. The cancer industry was dedicated to preventing the public from discovering that there was a painless treatment that had a 100% cure rate for terminal cancer. It was also inexpensive because it operated on a minimal amount of electricity. The medical establishment didn’t want people to get the “dangerous idea” that they didn’t need drugs; that would mean they didn’t need Big Pharma! The medical mafia (American Medical Association, American Cancer Society, and FDA) was on the trail to stamp out, obliterate, and debunk the truth before it could ever get out. And they were pretty successful… for a while. Dr. Royal Rife kept meticulous records of his laboratory results, including stop-motion photography, resulting in a huge archive of evidence that his Rife Frequency Machine worked. Using a “beam-ray device” − or frequency generator − he emitted electric impulses to gently, painlessly, target cancer viruses inside of the cells. It caused the viruses to become denatured (structurally break down) which deactivated them. More specifically, Dr. 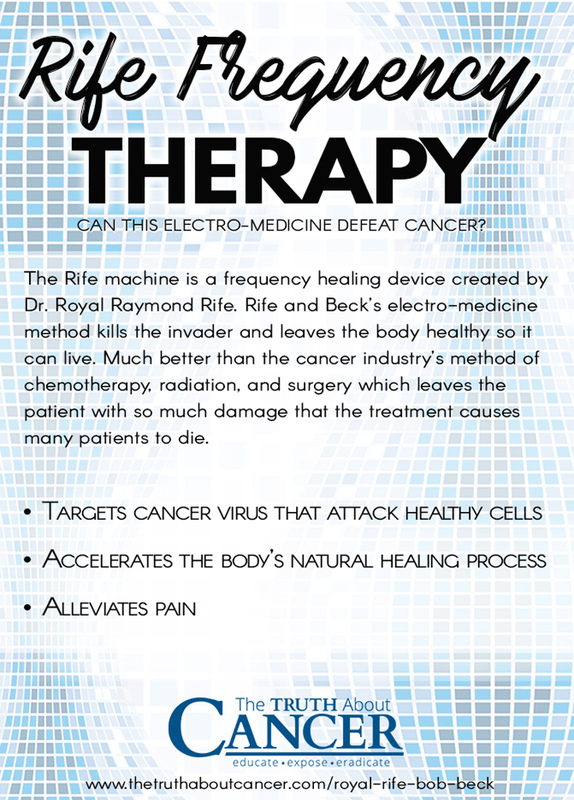 Rife used a two frequency generating machine to send a “carrier frequency” (high radio) and the low frequency that matches the microbe’s (cancer virus) signature frequency into the body. This electrical energy penetrated the cell membrane of the cancer-infested cell and caused the microbe to over-oscillate and implode. It is somewhat like a laser putting a hole in the target resulting in the contents flowing out and killing it. Note: It is very important that the Rife machine outputs radio frequency and not audio for the best results because radio frequencies penetrate the body better than audio frequencies. Royal Raymond Rife’s success was the beginning of his downfall. His character was destroyed, his microscope was dismantled and key parts stolen. His colleagues were threatened so that they turned their back on him and his archive of evidence proving that cancer can be cured was also stolen. It was devastating, but he continued on with his protocol the best he could until he died at age 83 in 1971 from alcoholism and sleeping pills. This method was very interesting. It worked similar to Rife’s electromagnetic frequency but used a longitudinal wave instead of radio frequency. This wave penetrated the subject and reversed the diseased condition back to a time when the condition did not exist. 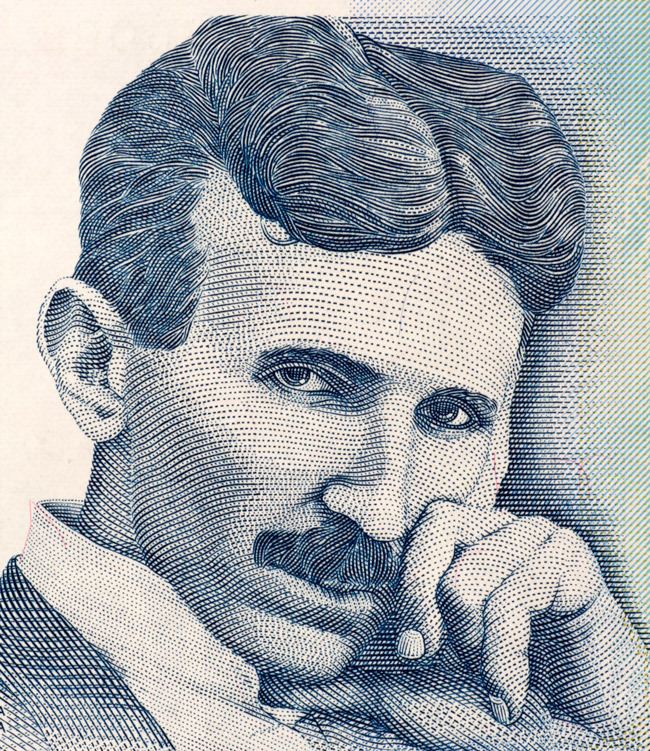 Although there is no known record of Tesla developing any technology specifically to heal cancer, it is likely that he did make a contribution. Sadly, though not surprisingly, this important contribution was also stolen and hidden from society when Tesla’s labs were destroyed. Antoine Priore developed electromagnetic devices for healing in the 1960s and 70s that his tests showed were also 100% effective against all diseases, including cancer. Priore understood that all living beings have a cellular structure that emits electromagnetic waves. These waves have a specific unique signature or thumbprint. When one learns the thumbprint of a specific microbe (including the cancer virus) that microbe can be obliterated by amplifying the electrical wave impulse. Furthermore, the electric wave can be reversed by introducing a mini-wave. This is how the time reverse system of Tesla works. Somehow, when a little wave is introduced into the system, everything moves backwards along the path of the new wave − like a crayfish that swims backward, but with an amplified force. It causes a reversal of the condition that existed when the wave was introduced. This is the process of healing that was observed by Priore and how he achieved 100% healing against all disease conditions and restoration of body parts in the test subjects. The cells were induced with a longitudinal electric impulse that caused this reversal action to restore the cell to its original genetic predisposition. A “miracle,” so to speak. And very dangerous to a society that thrives on profiteering from disease. Thus, in the year 1974, all funding and support was suddenly withdrawn. This was done just before Priore could apply his system to a full body apparatus for humans instead of just lab animals. It would have required a four-story building to contain and operate the apparatus to irradiate the entire human body sufficiently so every cell was permeated by the electrical energy. This was necessary to accelerate the body’s natural healing mechanisms. Priore’s system is different from chemotherapy and radiation treatments. The apparatus is programmed with each microbe’s signature frequency that targets only those microbes. Because human cells have a different electro-magnetic frequency they are completely unaffected. One scientist explained it this way − the electrical impulses move through the body like a comb and gently flow past all the human cells without any stress. The microbes, on the other hand, get hit with the wave and experience stress that kills them. With chemo and radiation treatments there is usually significant damage to surrounding tissue. This causes severe stress on the immune system and liver to deal with the toxicity. In 1986, Barry Lynes published his book, “The Cancer Cure That Worked.” Lynes brought Rife’s technology back to the public arena for another opportunity to be recognized for combatting cancer and other chronic maladies. In 1990, Drs Lyman and Kaali, researchers at the Albert Einstein College of Medicine in New York City, discovered a cure for the AIDs virus using a similar technology as Rife, Tesla, and Priore. They applied a low voltage (50-100 microamperes) to the HIV-infected blood in test tubes. In this instance the protein coating on the virus that produces reverse transcriptase, an enzyme that is necessary for penetrating the membrane of human cells, was prevented by the current. So, if the virus is unable to get into the cell membranes, then it is also prevented from setting up production in the nucleus to reproduce itself. This shuts down its entire system. Left unchecked, the DNA of the host cell reproduces the virus until it bursts and releases millions of newborn virii into the bloodstream to invade other areas of the body. Moreover, if the virus cannot produce reverse transcriptase enzyme it also becomes visible and vulnerable for attack by the immune system. Thus, it gets destroyed. The two researchers used electrodes that they inserted into HIV patients’ veins to get the electrical impulses inside the body. This method was expensive and had to be redone every month because it damaged the blood vessels. But it was very effective against the AIDs virus. In 1992 Lyman and Kaali received a patent on their method which proved beyond doubt that it worked. However, it was kept hidden from the public once again. In 1991 Dr. Bob Beck, a scientist, was introduced to the technology that the Albert Einstein College of Medicine researcher Dr. Kaali discovered and altered the technique to make it non-invasive. He applied the electrodes to the skin where the veins and arteries are closest to the surface. This would be the wrist and the ankles. He found the wrist to be especially conducive to the current entering the bloodstream and knocking out the pathogens (microbes). The amount of current is only 50-100 micro amperes so it doesn’t damage the skin or cause any adverse conditions. It was Dr. Beck’s firm belief that cancer is caused at the “systemic level” by the imbalance between the number of cancer cells circulating in the blood and the strength of the immune system. His solution was to remove microbes from the bloodstream and “supercharge” the immune system, which in turn allows the immune system to fight off the cancer cells as it was meant to do. Dr. Bob Beck devised a treatment program whereby he attached electrodes to the wrist of the patient in a specific way. This allowed the micro-currents (small electrical current) to penetrate the skin and enter the bloodstream. These gentle electrical impulses destroyed the microbes and allowed them to be flushed out of the body through the normal elimination processes. It was kind of like doing spring cleaning on a systemic level − removing the trash allowed the defense system to kick in at a much higher capacity. In doing this he discovered that electrifying the bloodstream effectively destroyed pathogens, bacteria, viruses, fungi, cancer, and more. The general term for these “things” is microbes. They are so small you need a special microscope to see them. They enter the body through various means, such as improperly cooked meat, GMOs, processed foods, chemtrail air, and polluted water (including bottled water). These microbes interfere with the immune system and the mitochondria’s production of energy so they effectively weaken the body on the systemic and cellular level. When they enter the cell’s nucleus they set up production of cancer cells by changing the DNA to replicate cancer cells. This is how cancer becomes tumorous and mass produce these tumors rapidly. Then the microbes move on to attack other cells and set up more colonies of themselves. This is referred to as metastasis. The good news is, there are a limited number of microbes that are cancer viruses so the task of determining their signature frequency was not too difficult. Royal Rife had already mapped them out, and through Dr. Lynes research it was brought to light for use again. Then steadily applying the plasma wave radiation or low frequency waves to it caused its destruction without fail. The other interesting phenomena is that when the cancer virus inside the human cell is destroyed, the human cell is reverted back to its normal functions. This phenomenon stems from the understanding that cancer cells start from a normal human cell. Something goes wrong, whereby a cancer virus is allowed access to the interior of the cell. Then it takes over the cell’s master cellular control system. The virus becomes a parasitic entity living off the cell’s nutrients with its own master control system. It is like an organism living inside of the cells that takes over and forces the cell to reproduce the building blocks for the parasitic part to take over more and more of the body. But when the virus is dismantled, the master cellular system is restored to the cell and all the previous functions are resumed − assuming the treatment aimed at the cancer doesn’t destroy the human cells. This reversal of cancer in the cells saves the body from the extra work necessary to form new cells. The disease is simply removed from the cells and the body is restored. If some tissue is damaged beyond restoration it must be rebuilt, but the bulk of the tissue is left to resume its normal activities. In contrast, the cancer industry’s method of chemotherapy, radiation, and surgery leave the patient with so much damage that the treatment itself is the cause of death in many patients. On the other hand, Rife and Beck’s electro-medicine method kills the invader and leaves the body healthy so it can live. A much better system! Dr. Beck also includes nutritional protocols to strengthen the body to eliminate waste faster and slow down the detoxification process. Too much detoxification performed too quickly can cause systemic problems. A weak person can suffer serious repercussions if the process is not done correctly. For this reason, it is highly recommended that a person using the Rife and Beck protocols also employs an expert practitioner that can monitor their health and progress. Once you realize that what you eat has a significant effect on your health, then you understand that you must change your diet permanently. This is how you can prevent or maintain your health after serious illness. In the Sources & References link below this article I have listed several resources for further investigation of this important topic. Rife machines are available on the market but only for use to control pain and for veterinary applications. This is because the Cancer Industry is not willing to suffer the loss of profits on systems that work. There are ways to get around them though and you may find the references very enlightening.